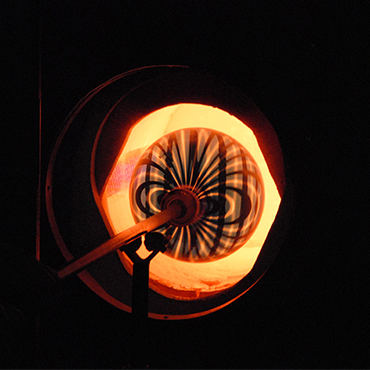 PGC is recognized among national and international glass artists as having one of the world’s best-designed and well-equipped hot shops. This 2,560-square-foot space accommodates both large and small teams, and ample annealing space facilitates both rapid production and large-scale work. Two 1,000-pound-capacity, state-of-the-art Wet Dog furnaces run 24/7 at a temperature of 2,100˚F to continually provide quality clear molten glass. There are eight workstations, each with a glory hole and shaping bench. Many esteemed glass artists, including Lino Tagliapietra, Dante Marioni, and Davide Salvadore, have worked here. A 2-hour minimum applies for all rates in the Hot Shop unless otherwise noted. Please remember to always check in and out with a technician that is on duty. Other fees may apply for failing to clean up ($25), failing to check out ($25), canceling within 24 hours ($50), and/or damaging equipment. Open studio is available if you are currently enrolled in a PGC hot shop class. A technician will be on duty to answer questions or help troubleshoot. No charge for the use of blocks, hand tools, pipes/punties,; charges for all other extras still apply. Complimentary use of pipes/punties, hand tools, and blocks. Charges for all other extras still apply. All charges apply including the use of blocks, hand tools and pipes/punties. These are the charges that may occur during your rental time. For every 2-4 hour session, 50 lbs. of glass and half a small annealer are included. Large quantities of glass usage, extra annealer space and long annealing cycles may incur extra charges.